Cheesy Herb Individual Potato Gratin is a fun twist on the classic side dish, perfectly portioned for everyone at your holiday dinner table. 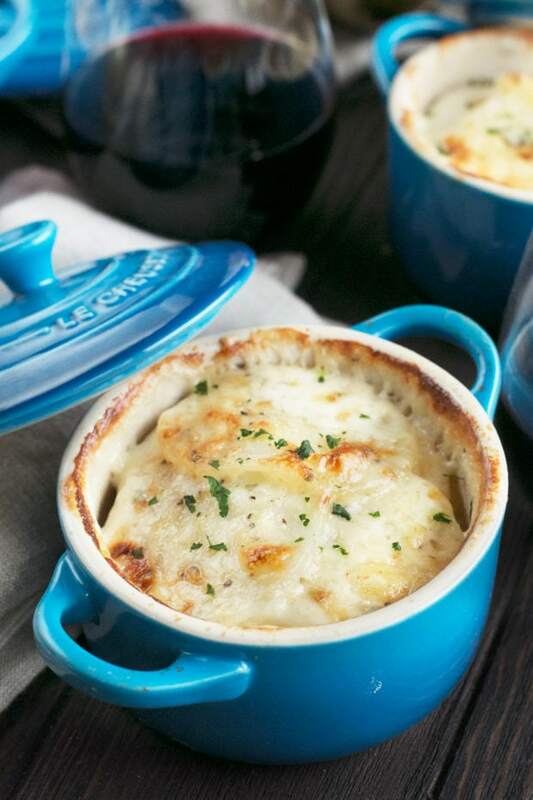 The individual side dishes hold creamy, cheesy, herbaceous potato gratin, layered up in mini cocottes that will really wow all of your guests! Disclosure: This post is sponsored by the Le Creuset. While I was compensated, as always, all opinions and the recipe are my own. Thanks for supporting the brands that support Cake ‘n Knife! Every year when I think about a Thanksgiving menu, I always like to think about new and simple ways to update those old recipes that my whole family loves. It’s tough when you are someone who loves to cook something different all the time, especially when your family loves the classic recipes every year. 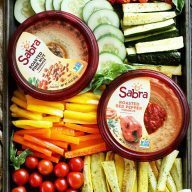 So while I would love to have a global inspired Thanksgiving, so often the demand for the familiar Thanksgiving dishes outweighs my crazy menu ideas. Which of course I am totally fine with, because who doesn’t love a bit of tradition in their lives? That’s why I end up making up new takes on familiar flavors for the holidays! 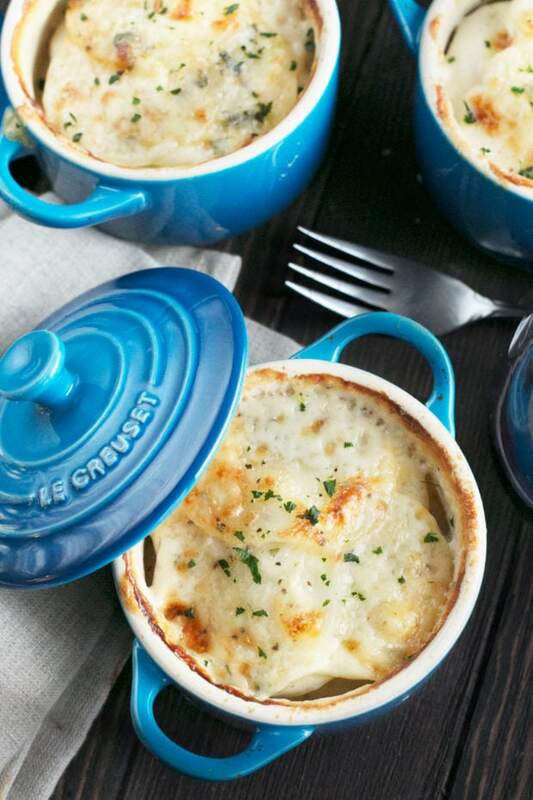 My inspiration for my potato side dish this year came from one place… Le Creuset! 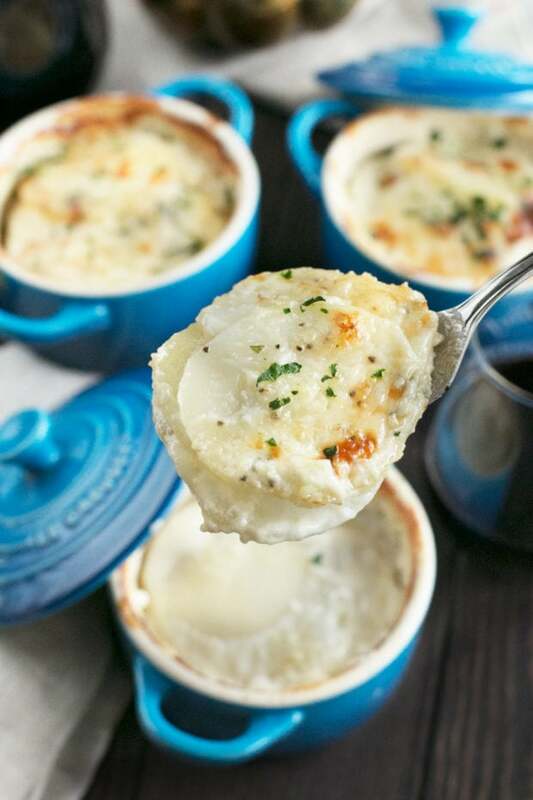 These little individually portioned potato gratins are creamy, cheesy and filled with fresh herb flavors. The potatoes are melt-in-your-mouth tender and you’ll be hard pressed to have any leftovers, that’s for sure. Not to mention, they are even easier to make than a giant batch of potato gratin, and everyone gets a taste of that perfectly golden cheese on top! 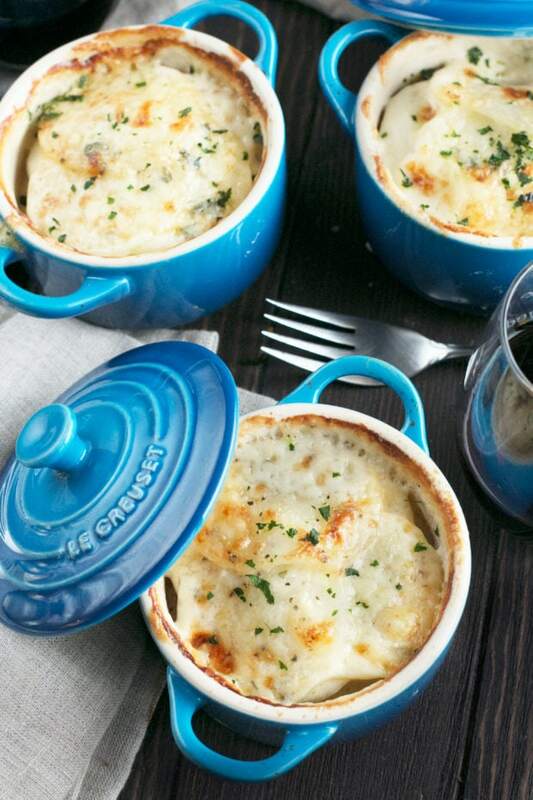 Can we take a second and honestly talk about how adorable these Le Creuset Mini Cocottes are?! 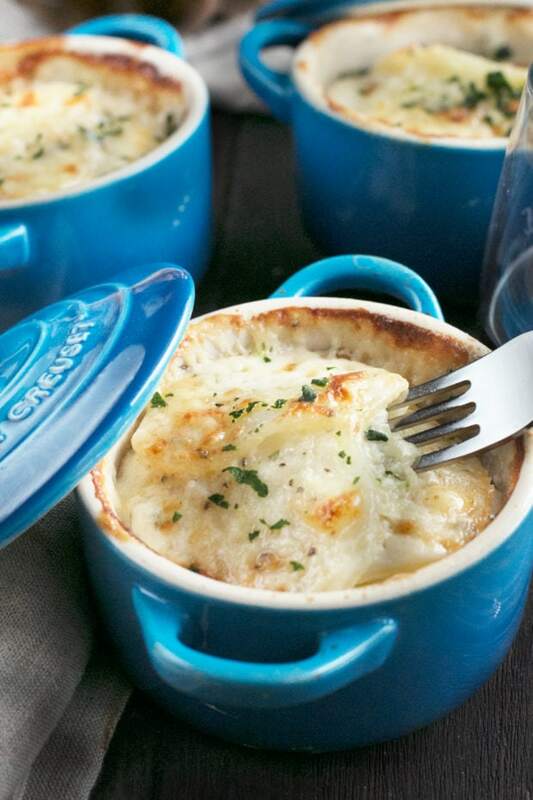 Not only are they the perfect size for any individually portioned side dishes or desserts. PLUS the colors are absolutely STUNNING on the holiday table. Personally, I am in love with the Marseille flavor, but the Cerise and all the other colors are absolutely brilliant. They bring so much life to the table at any time of year! 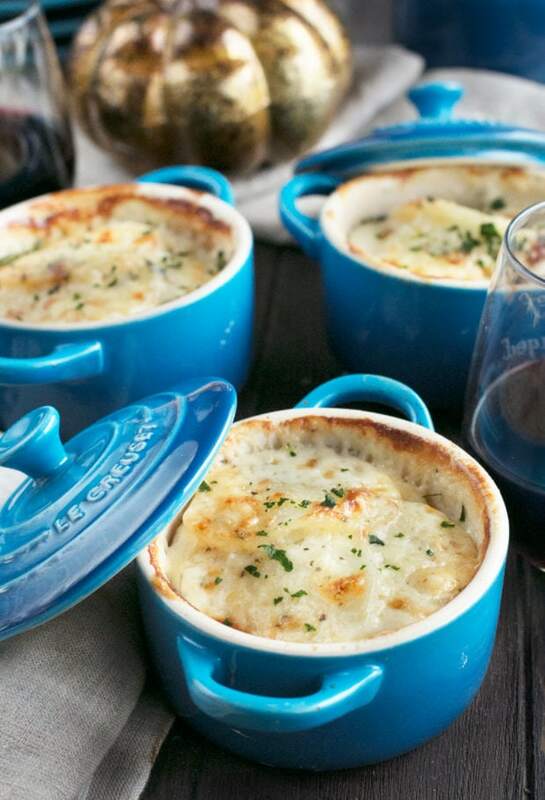 Plus these little cocottes are dishwasher AND microwave safe (as well as oven safe, obviously), making them my little lifesavers when it comes to hosting dinner parties. 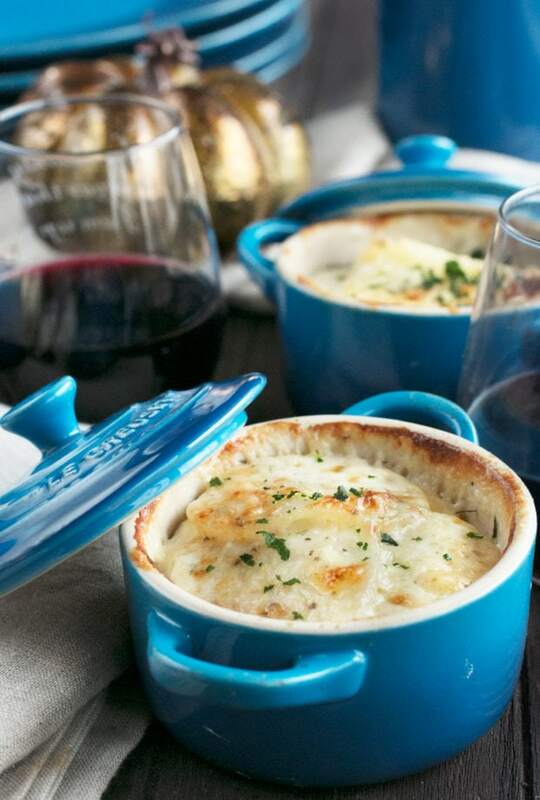 With the quality of Le Creuset’s cookware, these are the kind of dishes you want to stock in your cabinets for years and years to come! 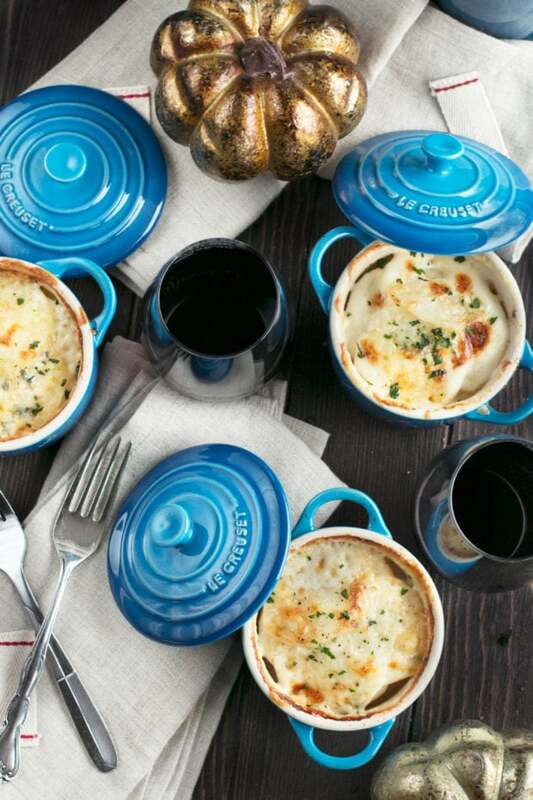 Le Creuset wants you to have a pop of color in adorably sized dishes this holiday season too, so they are oh-so graciously giving away one of their Le Creuset Set of Mini Cocottes (a $75 value)! 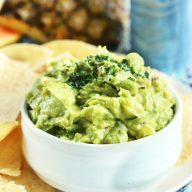 Check out the giveaway below the recipe. GOOD LUCK! ALSO, just a little tip from me to you… Keep your eye on my blog in December. I’ve got HUGE things coming up for y-o-u this holiday season! is the perfect gift for friends and family (and yourself!)! is my most reliable pan and I looooovvvve this blue color! Pin this Cheesy Herb Individual Potato Gratin recipe for later! These cute little potato gratins are an even easier version of your favorite potato side dish, with fresh herbs and extra cheeeeeeese! Preheat oven to 400 degrees. Line a baking sheet with parchment paper. Set 4 mini cocottes on the baking sheet. Divide potato slices evenly between the mini cocottes, layering them in a staggered circle so the slices lay flat. Over medium high heat, add heavy cream, thyme, oregano, bay leaf, salt, and pepper to a medium saucepan. Bring the mixture to a simmer. Remove from heat. Remove and discard the bay leaf. 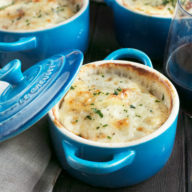 Stir 3 oz white cheddar cheese and 2 oz gruyere cheese into the cream mixture, until melted. Slowly pour the mixture into the 4 cocottes, dividing evenly between them. In a small bowl, stir remaining cheese together. Sprinkle the cheese on top of the cocottes, dividing evenly between them. Add the baking sheet with the mini cocottes to the oven. Bake for 30 minutes, until the potatoes are cooked through and golden brown on top. Let rest 10 minutes before serving. Garnish with fresh parsley and serve immediately. Enter the giveaway through the Rafflecopter widget below. Everyone gets a free entry! You can enter multiple times by following and sharing on social media. (If you’ve followed in the past, that counts! Just enter the information as prompted.) All entries will be verified. No purchase is necessary to win. The giveaway is open until Monday, November 20th at 11:59 p.m. CST. One winner will be chosen at random and e-mailed within 48 hours. Winners must claim prize within 48 hours of initial contact. The retail value of the prize is $75. Prizes listed above are the only ones available. Open to U.S. residents with a valid shipping address only. Stuffing and anything potatoes. Oh and Pies! YUM! I am most looking forward to sweet potato casserole with pecans and caramel drizzle. My favorite and we only make it at Thanksgiving and Christmas. My son always makes the best homemade mashed potatoes and I make the gravy, we really enjoy, thanks! It’s all about perfect stuffing and mashed potatoes. Classic are classics for a reason! I look forward to the stuffing. I make a killer broccoli and cheese casserole that I am already craving and can’t hardly wait to sink my teeth into! I am looking forward to the homemade mac and cheese. I like steamed and roasted vegetables! My Mom’s baked beans are delicious, so I can’t wait! I am looking forward to cranberry sauce. I like oven baked macaroni and cheese with the golden brown layer of cheese on top. Candied Sweet Potatoes with Marshmallows and candied pecans is my favorite! I am looking forward to eating some roasted turkey! I always look forward to the cornbread dressing the most. I’m looking forward to cranberry sauce! my favorite side dish has to be stuffing! i could eat it all day if my stomach would let me! I’m looking forward to some Southern Candied Sweet Potatoes. I love my mom’s stuffing recipe for the holidays. My uncle always makes a big holiday ham. That’s my fav dish and we only have it once a year! My mom’s corn pudding definitely. Stuffing – not in the bird, outside the bird. I’m looking forward to sourdough bread stuffing. I have always loved stuffing, I mean the whole meal is superb, granted, but we hardly get the treat of having this wonderful side dish any other time of the year! I am looking forward to the pecan pie! Mashed turnips. Thanksgiving is the only time the family will eat them! I’m going to give that to the green beans. Slow cooked with bacon, mushrooms and sweet onions. The best! I am looking forward to baked mac and cheese and squash casserole. All kinds of pie. Dutch apple and cherry for sure. I also love stuffing and homemade rolls! Oh man, that’s a tough choice – there are SO MANY foods I’m looking forward to eating. I think I’m especially excited for the lemon meringue pie I make every Thanksgiving. Homemade Mashpoatoes & Green Bean Casserole! I’m looking forward to eating buttermilk pie. I always look forward to Cornbread Dressing. I don’t know why I don’t make it more often! I cannot wait for some cornbread casserole!! Candied Yams. I only eat them once a year and I look forward to them for weeks before Thanksgiving. I cannot wait to have my grandmother’s sweet potatoes – she’s 89 years old and she still makes them just for me! Thanksgiving is all about the stuffing for me. I love my mother’s corn bread stuffing and my mother in lwas sausage and caper stuffing. I definitely indulge myself in the bready side of life for the holidays. I’m most looking forward to my grandmother’s stuffing! Looking forward for my sister’s homemade cranberry sauce! My homemade Mac & Cheese is always a hit and I love sweet potato anything! I’m looking forward to the stuffing! It’s always my favorite. I love eating mashed potatoes with homemade turkey gravy! It’s not Thanksgiving without stuffing! I’m excited for sweet potato casserole! I’m looking forward to stuffed mushrooms! Should the cocottes be covered during baking?